A pen bag or pencil bag, like a pencil box, can be used to carry pens, pencils or other stationery, while it is more convenient and requires less space. As the pen bag usually is made of fabric, it is antirust and can be washed with water. 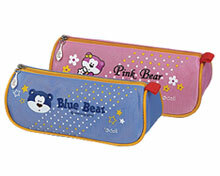 Today, our pen bag, with a cartoon bear, is very popular with schoolgirl. 1. Our pen bag is made of the combination of fabric and nylon for great durability. 3. The pen bag can be in various shapes and colors to suit customers' different requirements. Deli Stationery is a specialized pen bag manufacturer and supplier in China. Since our foundation in 1988, we have been dedicated to the development and production of stationery. Now we are able to provide a wide range of office supplies, including ball point pen, gel pen, highlighter, pencil, water color pen, paper clip, office pin, and more. As our products are reasonably designed, reliable, low priced and easy to use, they are very popular with customers from Japan, the USA, Canada, Australia, Russia, Britain, Germany, Italy, France, South Africa, and other countries. For more information, please feel free to contact us. We are looking forward to working with you!